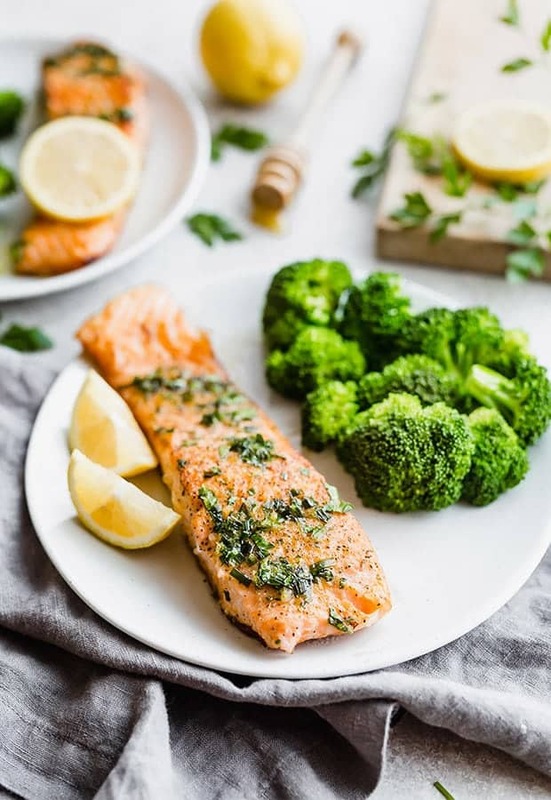 Have you ever had Lemon Honey Glazed Salmon? If not, you’re really missing out. This salmon recipe is healthy, flavorful, and refreshing. 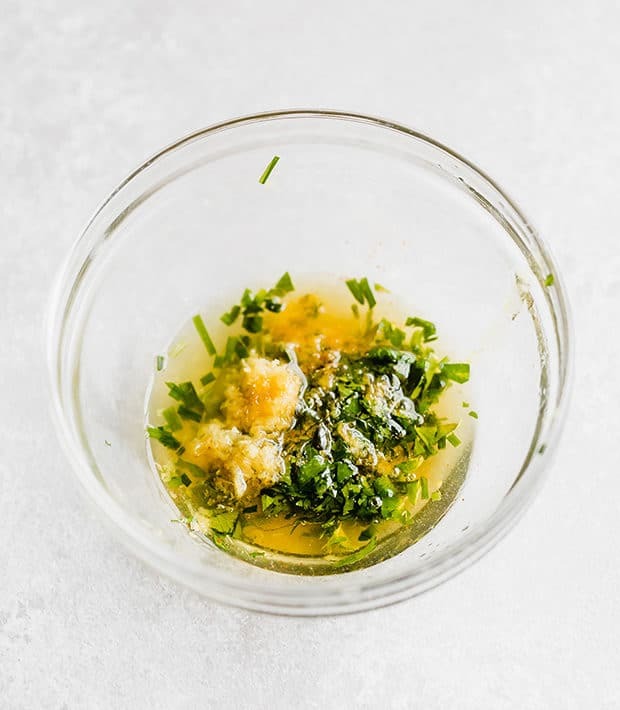 The lemon honey sauce has fresh lemon zest, chopped chives, and parsley. And if the sauce wasn’t enough to convince you, then read on to discover a secret to achieving a perfectly cooked crust on this skillet salmon. Yes, this salmon is cooked in a skillet. If I were being completely honest with you, I’d tell you how obsessed I am with my skillet. I love it! 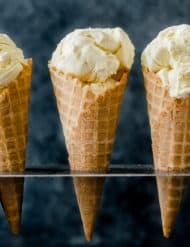 I’ve made a handful of recipes using that one kitchen tool! 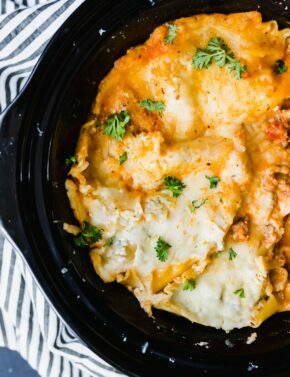 Pizza dip, skillet lasagna, and my caramelized onion dip to name a few. 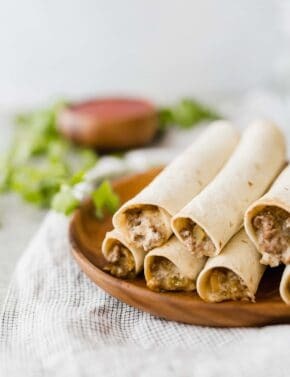 With it being the New Year and all, I figured I better post some healthy recipes. First, start by preheating an oven to 450°F. Place a cast iron skillet in the oven while it’s preheating. *I will explain why we do this below. Whisk the ingredients together until everything is combined. Go ahead and set this aside, we’ll come back to it once we’ve cooked the salmon. 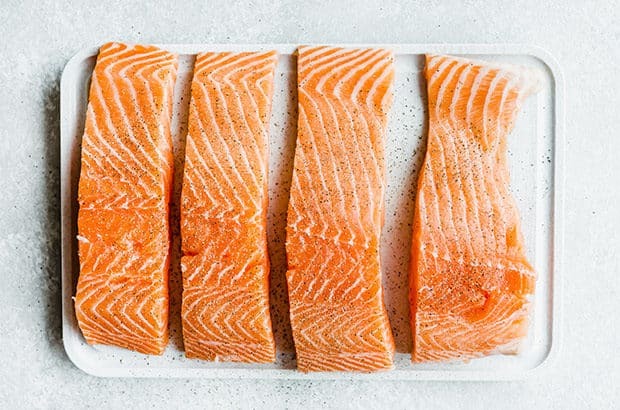 You can make this salmon recipe with skin on fillets or skin off fillets. For this go around, I made it without the skin. There are notes in the recipe card for those of you who want to use skin on fillets. Season the salmon with some salt and pepper. If you’ve ever wondered how to cook salmon in a skillet, keep reading. Seared salmon is easy, and doesn’t take long. To get that deliciously crisp sear on the salmon I’m going to share a few tips. First, make sure you have a large enough pan to accommodate the salmon fillets. Like I mentioned above, I used my 12 inch cast iron skillet to cook this salmon. Remove the salmon fillets from the refrigerator prior to cooking. You don’t want to place a super cold fillet on a piping hot pan. If you do this, the cold salmon is more likely to seize up and cook unevenly. Dab the salmon with a paper towel prior to cooking. Removing some of the fillet’s excess moist helps the fish to crisp up. And if you didn’t already know this… a moist fillet is more likely to stick to the pan. We don’t want that! Use a HOT pan. This is a must when making pan seared salmon. Pro tip: Place a cast iron skillet in an oven preheated to 450°F. Doing this will ensure the skillet is HOT! And not spotty hot, but evenly heated throughout. Now that you have a hot skillet, place it over medium heat. Pour the vegetable oil into the hot pan and then carefully lay the salmon fillets into the skillet. Be careful! The oil will most likely splatter, so be cautious. Cook the first side for 3-4 minutes. Using a spatula, flip each fillet over and continue cooking the other side until the meat is fully cooked and an instant read thermometer reads 130°F. Transfer the salmon to a plate and spoon the lemon honey sauce overtop. Serve immediately! 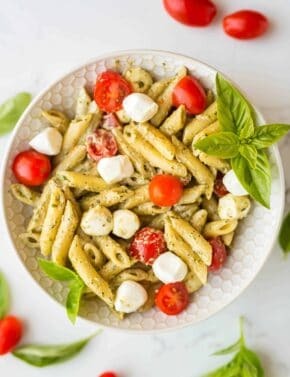 Here are more recipes I know you’ll love! 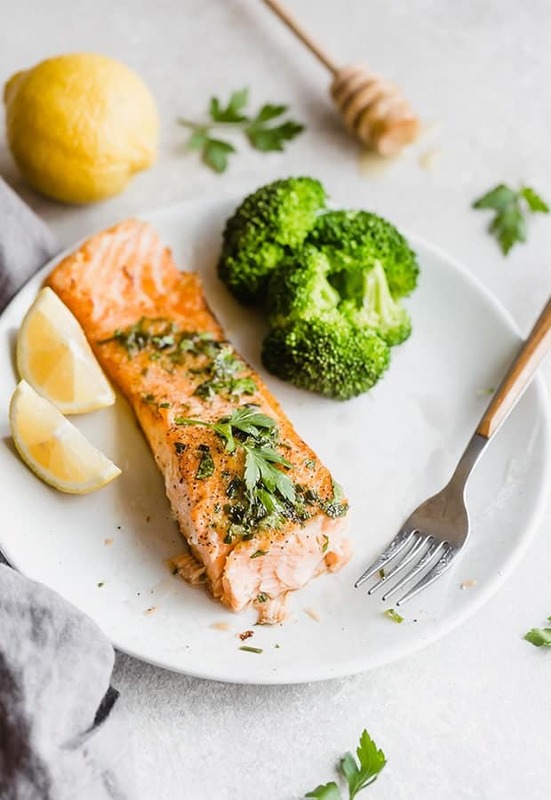 This lemon honey glazed salmon is healthy and offers a lot of flavor! 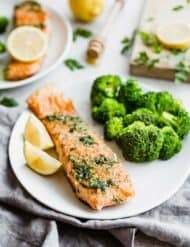 It's an easy dinner recipe that only takes 30 minutes to make, and to top it off this salmon recipe is make in a skillet. Preheat oven to 450°F. Place a 12 inch cast iron skillet in the oven as it’s preheating. Remove the salmon from the refrigerator. In a small bowl combine the honey, chives, parsley, lemon zest, lemon juice, and cayenne. Whisk to incorporate and then set aside. Using a paper towel, dab the salmon to remove excess moisture. Season both sides of the salmon with the salt and pepper. When oven reaches 450°F, turn off the oven and using hot pads carefully remove the skillet from the oven and place it over medium heat on your stovetop. Add the vegetable oil to the hot skillet. Place each salmon fillets in the skillet. Cook for 3-4 minutes, flip and cook the other side for 5-8 minutes or until the center is fully cooked. The middle of the meat should read 130°-135°F with an instant read thermometer. Spoon the lemon honey sauce overtop. Serve immediately. 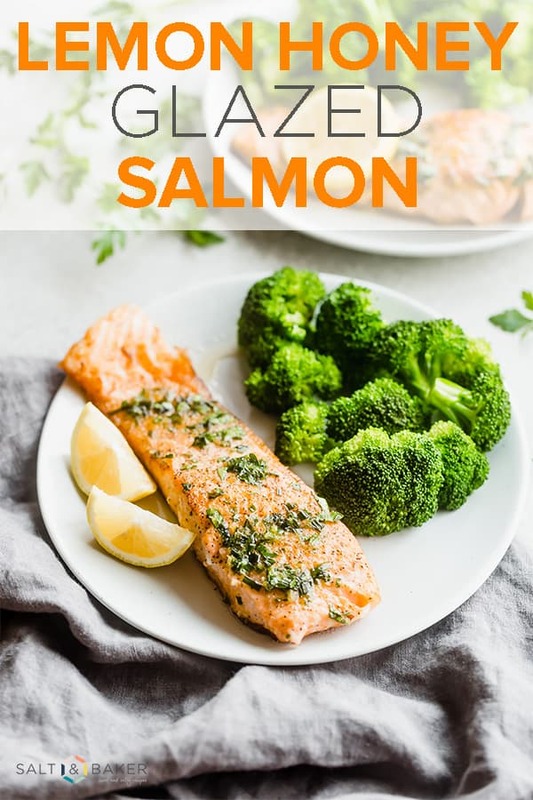 *This recipe states 24 oz of salmon, however, you can use just 16 oz or even 32 oz! 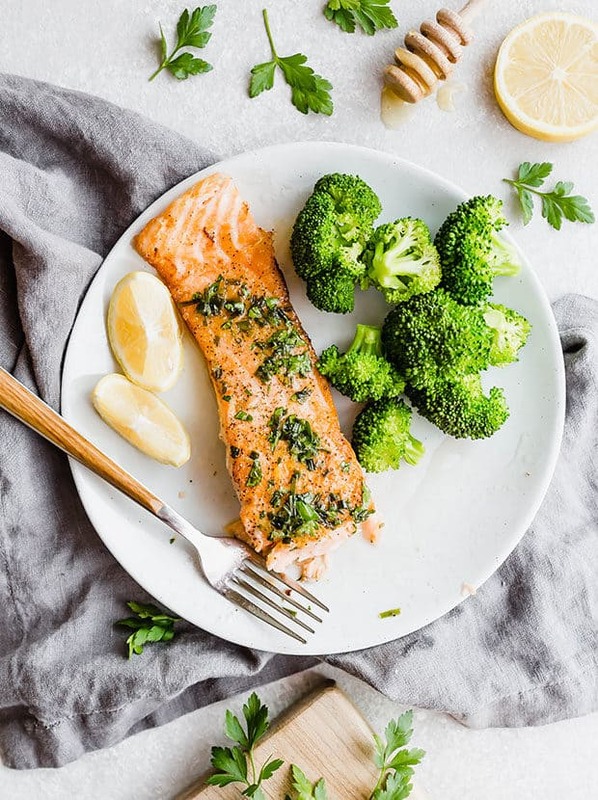 If you cook more salmon you'll have less sauce to spread across the fish, if you only cook 16 of salmon you'll have a lot of sauce to drizzle overtop the cooked salmon. NOTE: you can use skin on salmon fillets or skin off. If you use skin on fillets, place the flesh side down in the skillet FIRST! Cook for 3 minutes and then flip and cook the skin side for about 8-10 minutes or until the center is fully cooked and the meat reads 125°F with an instant read thermometer.